Nan’s worked at a theater, the beach, a public relations firm, a magazine publishing company, an investment bank, a university and a public library. Her first job was as the official bell-ringer for her older sister’s ice cream truck. She was paid handsomely in ice cream bars. Nan enjoys reading, staring out at the Barnegat Bay, and going on car rides to places she’s never been. She’s a terrible martial arts student but finds board breaking energizing. 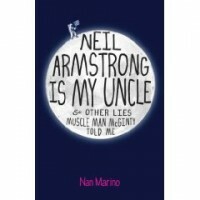 Here’s little bit about Neil Armstrong is My Uncle and Other Lies Muscle Man McGinty Told Me which comes out in May 2009. It’s the summer of 1969, and things are not only changing in Tamara’s little Long Island town, but in the world. Perhaps Tamara could stand to take one small step toward a bit of compassion and understanding? A terrific debut novel with truly vivid characters and a wonderful voice. It happened the week I decided it was never going to happen. I even stopped checking my emails and did not see the one from my agent saying a book offer was coming. The next day when we spoke by phone, I was standing in the park across from the library where I work. I jumped in the air. I rambled a lot. I tried hard to listen to everything my agent was saying, but got caught up in words like “hard cover” and “published in the spring”. After I caught my breath, I phoned my husband, who said, “You see Nan, dreams do come true”. There have been so many great moments, like getting that first editorial letter from my amazing editor and seeing the cover for the first time. Each moment makes it feel more official. Getting an ISBN number was huge. I’m a librarian, and we take ISBN numbers very seriously. My path was bumpy. And long. I scribbled my first story the day a school librarian friend remarked that she wished she had a story to go with her new set of penguin puppets. From that point on, I was hooked. But I had a lot to learn. Fortunately, for Christmas, two friends gave me a gift of membership to SCBWI. Through that, I found critique groups and writing buddies. Over the years, I kept writing and learning. One day, one of my manuscripts got the attention of dream agent, Rosemary Stimola. She asked for a rewrite and then signed me on! Last spring, she sold Neil Armstrong is My Uncle and Other Lies Muscle Man McGinty Told Me to Roaring Brook Press. Once I was rejected from a critique group specializing in humor. I sent them a story filled with my favorite funny lines. The moderator told me that she liked my writing but there was nothing humorous about it. There was another time when I got two rejections from a single query letter. By the time I got my second one, I was thinking, “I get it already”. I guess my best rejections were those letters that implied ‘almost’. It’s funny how something can be both uplifting and heartbreaking at the same time. I’m a librarian so in a way, I’m in the book business. Libraries are a great place for stories. Not only am I surround by all those books, but almost everyone who comes into the library has a story to tell. Worrying is one of my favorite pastimes, and I’m very good at it. Let’s see, what’s on the worry list for today… what will the reviews be like… will this book earn out its advance…will I being able to finish my next story… the list goes on. There is no typical day. I try to fit in writing whenever I can. I’ve never been good at routines, although I do notice that the farther away I am from my computer, the more ideas I have and the more I want to write. My three-chapter freetique was eye opening. One thing that the very wise Snoop and Cynthea pointed out was that I was holding back information. That was a slap-the-side-of-my-head type of moment. Instead of trying for drama, all I needed to do was let the story unfold. It really is a big deal when you discover something about one of your characters, finish a story, send out a query and even get that first rejection. Celebrate those personal milestones, no matter what the outcome. Don’t try this alone. Find people who share your passion. Even if you’re shy about posting like I am, writer’s boards, like Verla Kay’s blue boards, are a great source of support. Find a good critique group, and if you can find a writing buddy or two to share your angst and accomplishments, you are on your way. Unless you find something else that you’re equally passionate about, don’t give up. And always read your emails. I have two quotes by my desk. One is “leap and the net will appear”. I’m not sure I do enough leaping either in my writing or in my life. It’s a good reminder. The other is torn from one of those Chicken Soup calendars. It says: “Consider this…In 1887, the Musical Courier wrote: ‘Brahms evidently lacks the breadth and power of invention eminently necessary for the production of truly great symphonic work'”. Something about that quote always makes me smile. Even though it’s a book about setting up child/parent reading groups, “Deconstructing Penguins” by Lawrence and Nancy Goldstone contains chapters on conflict, location, pov, antagonist/protagonist, etc. They take apart classic children’s stories and get to the heart of every one of them. I love the authors’ premise that every work of fiction is actually a mystery. Sol Stein’s “How to Grow a Novel” is never far from my desk. Finally, Snoop wants to know: So Nan, why does your first book take place in July of 1969? Glad you asked, Snoop. The day that the first man walked on the moon is one of those moments in history that elevated the human race by filling our hearts with hope. I wanted to write a story about what it felt like to watch it happen. 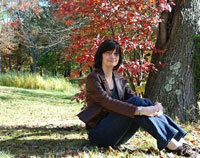 This concludes our interview with our latest author, Nan Marino. We wish her much success with her debut novel Neil Armstrong is My Uncle and Other Lies Muscle Man McGinty Told Me. This is one of two books my inner ten-year-old is excited about based on the title alone. The other is The Magician’s Elephant by Kate DiCamillo. By the way, I’m told I watched the moonwalk, even though I was only 8 months old. My mother said she held my infant face to the TV screen so I could tell my grandchildren that I saw it. I now understand. Yay Nan!! Terrific interview! I can’t wait for NAIMU to come out…only 18 more days!! A friend at work said she did the exact same thing with her 6 month old. I bet there were lots of babies watching that night. just how subjective it all is. My first YA, Stepping Up is out now and I’m on AOTV too. I think you’re one hundred percent right about humor being subjective. It’s really great when other people get you. By the way, your book is on my “to read” list.